weapons, including free flight and guided missiles. gun barrels and the flow of fluids in porous media. kinetics, shaped charge behavior, ignition, and heat transfer. data, and computation of satellite orbital elements. kill probability studies of missiles. which are also addressable as part of the memory. indicate variations of the basic order type. permitting decisions at 5 megacycles/second. Indexing and control will be concurrent with arithmetic operations. satellite system for the BRLESC. wait for the entire transfer to be completed. is used as index registers. and all five of these trunks can operate concurrently. can be expanded to 16 tape stations. paper to magnetic tape. 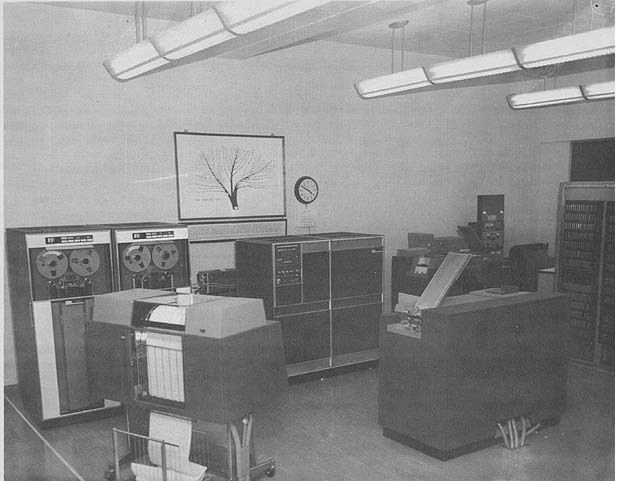 An IBM 1401 System has been added. transferring heat from computer closed loop air to closed loop chilled water. evaporative system absorbs heat from refrigerant in a cooling tower. Compressor located two floors below. Liquid coolant piped upstairs. consult the engineers when a total break-down occurs. and point-to-point soldered connections, and by changing tubes. addition to the normalized mode. general-purpose financial accounting, or as a satellite to a larger system. M & N variants of instruction. N = number of digits in multiplier. N = number of digits in divisor. 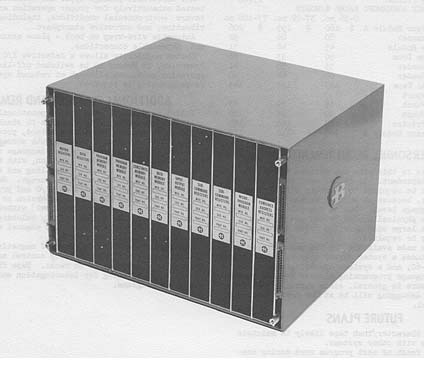 The magnetic tape is compatible with the IBM 727, 729, and 7330 tape units. Tape rewind speed is 320 inches/second. (1 or 2 possible in system. (1 or 2 possible in system). (Speed for flow mode. 1 possible in system. Card Reader, 80 columns only in the B 122 Card Reader. are read serially by character. (1 punch available in system. (2 printers available in system. operation. The Line Printer Buffer is loaded in 1.3 millisec. The Multiple-Tape Lister Buffer is loaded in 0.7 millisec. All other units use buffers located in the processor. 10 chars inch, the vertical spacing is 6 or 8 lines/inch. The paper tape used is 5, 6, 7, or 8 level tape. Any code may be translated. Fixed Core - each character checked for parity. Magnetic Tape - lateral and longitudinal parity check. Card Reader - validity check on all characters. Printer - parity and sychronization check. Card punch - hole and row count check. Paper Tape Reader - parity check on all characters. Paper Tape Punch - Validity check. Temperature range         - 72o F, + 8 - 7oF. the system units to achieve optimum operating efficiency. the customer. The system is deigned for easy maintenance. 0-36 mos. 37-72 mos. 73-108 mos. Training is made available by the manufacturer to the user. and less time per job. and a larger memory to be available early in 1964. M & N = M & N variants of instruction. L = the longer of the two. read-write heads provide lateral and longitudinal parity checking. Binary read and write is used. (1 or 2 possible in system . (Speed for flow mode. 1 possible in system). in B 124  Card Reader, 80 columns only in the B 122 Card Reader. (1 punch available in system). (2 printers available in system). use buffers located in the processor. a 12-channel punched carriage tape. The paper tape used 5, 6, 7, or 8 level tape. Any code may be translated. Temperature range - 72o F, + 8 - 7o F.
layout the system units to achieve optimum operating efficiency. 0-36 mos. 37-72 mos. 7--108 mos. Data Communications and Disk File abilities early in 1964. General purpose computing, on-line and real-time uses. or interrupt on receipt of external signal. Second processor module optional for true parallel processing. segmented programs using relocatable data storage areas. read-compute or writecompute possible on one channel. 7 for control state under Master Control Program. 1 bit exponent, 1 flag bit. fixed point number, made possible by signed exponent. and floating numbers. Double precision operation codes. i.e. the instructions are independent of storage addresses. Operations are performed on contents of stack registers. operational field in word mode. BCD to binary conversion, in either direction. for multi and/or parallel processing. gramming is not required for the feature. Fixed Pt. Floating Pt. Fixed Pt. Floating Pt. Solid-state logic in processors, including registers. Parallel (binary) arithmetic in word mode. Accetate or mylar base, iron oxide coating. provided, each protecting 4,096 words on drum storage unit. Read-write rate of drum is 8.1 microsec/char. heads provides lateral and longitudinal parity checking. 1 or 2 possible in system. (Total 3 for reader and punch). 80 column cards may be read on the 200 cards minute model. Can process MLP cards and postcard thickness. Immediate access clutch maintains high rate of speed. Character validity check on reader under operator control. column binary cards. Two 6-bit BCD characters/column. 1 punch optional in system. Immediate access clutch. Up to 2 printers optional in system, 120 chars/line. 1 optional in system 10" max. ordinate scale. Optional grid printing. Variable absissa scale. 1 or 2 possible in system. (Total of 3 for reader and punch . controlled by 12 channel punched paper carriage tape. Immediate access print cycle when buffer is filled. requiring I/0 channel only 1.5 millisec for buffer transfer. FIXED: Core - 1 bit/word parity check. Punch - checks characters punched. Tape - lateral and longitudinal parity check. Printer - drum synchronization check. OPTIONAL: DP and blank column detection on card punch. modulo 8 basis and row count. If a raised floor is utilized, it should also function as a cooling medium. A false ceiling serves as an ideal method to conceal return duct work. near the power supply cabinet. 0-36 mo. 37-72 mo. 73-108 mo. because of working at the problemoriented language level. fewer operating personnel may be required. B 5000 ALGOL-60, and a systems operating course. and debugging will be at the problem-oriented language level. of last program syllable of a word. 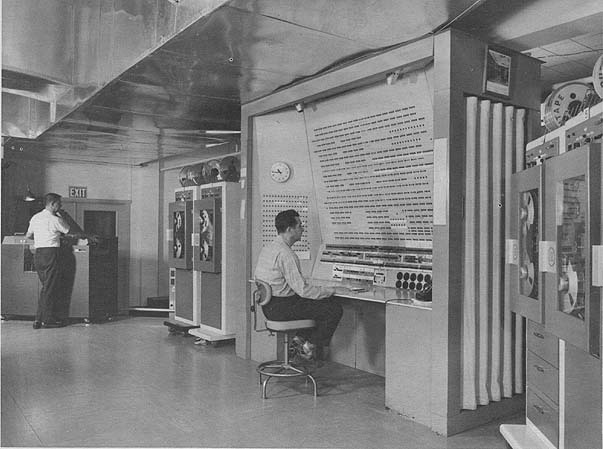 Disk file subsystem will be available in 1964.
extremely high even for military equipment. continues although at reduced speed, but no re-programming is required. above minimum requirement) without reprogramming. labelled at beginning for interrogation and recognition by programs. missile and satellite navigation and control applications. division, priority interrupt enter, interrupt return. to the parts used. 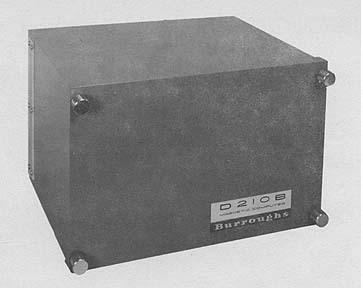 Burroughs specifications are used for all components. An air-conditioner is not required. The power requirement varies with the clock rate. can be controlled by the programmer. 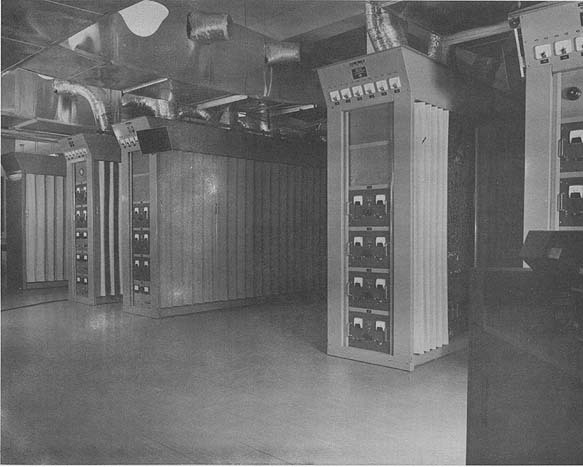 system capable of both multi-and-parallel processing. problems, communications store/forward and switching. One, two or three address. Format varies with types of instruction. various other control and storage functions. Four thin-film substrates are used. any one terminal device is 500,000 chars second. *This includes two functional modules. All figures are on a cabinet basis. peripheral devices. No air conditioning is required for central processor. and automatically diagnoses and bypasses its own failures. program restart after primary power failure. and each power supply has a self over/under voltage indication. and 1 to 10 input/output control modules. The complement of compiling languages is to be expanded. U.S. Naval Research Laboratory, Washington,D.C. Systems Development Corp., Santa Monica, Calif.